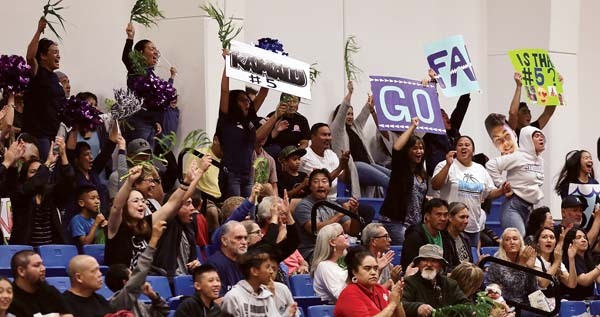 PUKALANI — Kamehameha Schools Maui made the Snapple Boys State Basketball Championships for the first time since 2010. The Warriors’ stay lasted just one day. Kapolei (13-1), the third-place team from the Oahu Interscholastic Association, used its significiant height advantage to pull away in the second half for a 49-34 victory Monday at Kaulaheanuiokamoku Gym. The Hurricanes move on to play top-seeded Maryknoll in the state quarterfinals Wednesday on Oahu. 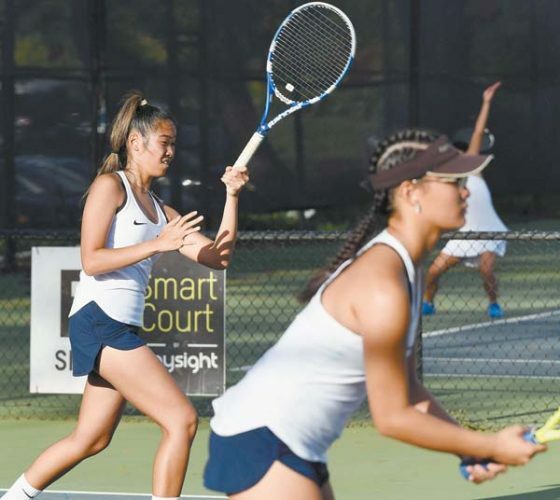 Kamehameha Maui saw its season end at 7-9. 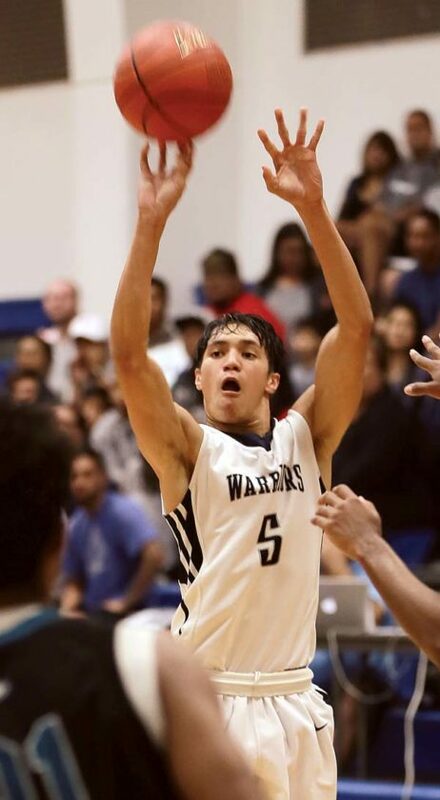 The Warriors’ Kamalu Segundo makes a 3-pointer. The Hurricanes opened 10-point leads twice in the first half, the last at 21-11. Kamehameha Maui finished the first half on a 9-2 run — on two 3s by Austin Peters and another by Kamalua Segundo — to close within 23-20 at the break. 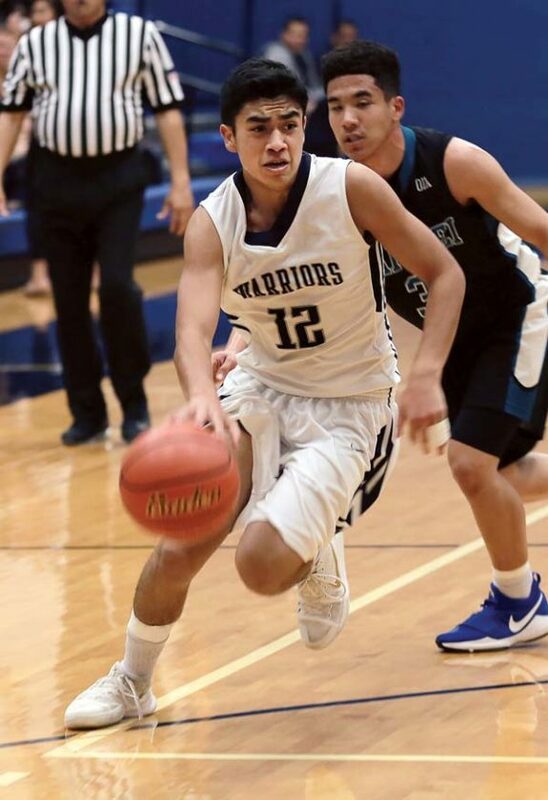 After the Warriors fell behind by seven quickly to open the second half, Kahai Bustillos’ basket brought Kamehameha back within 31-27 with 2:45 to go in the third. Kapolei’s Isiah Higa stole a pass and took it the other way for a 3-point play with 5.7 seconds to go in the third to push the lead to 36-27 going to the fourth quarter. Julius Buelow’s follow basket increased the lead to 40-27 with 5:05 to go and the lead wasn’t less than 10 the rest of the way. 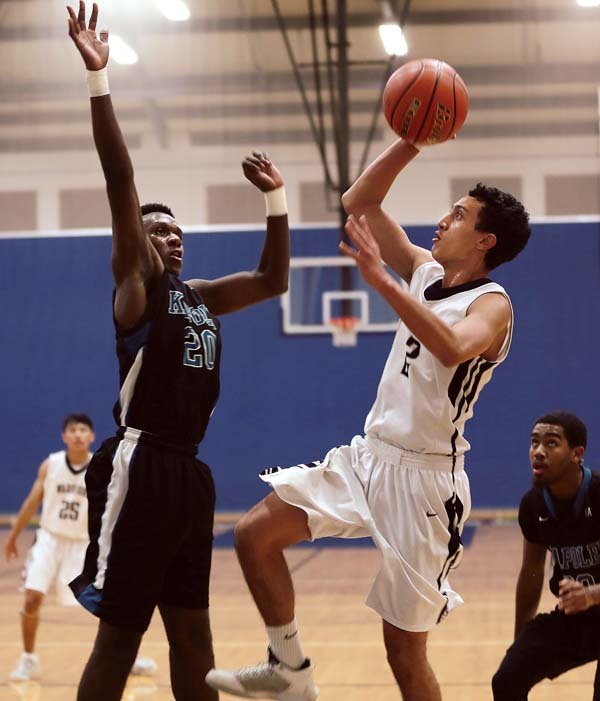 Kamehameha Maui’s Austin Peters drives past Kapolei’s Isiah Higa on Monday. Kapolei controlled the boards 38-22 — the Hurricanes’ roster features five players measuring between 6-foot-3 and 6-5, and tops out with 6-8 junior center Buelow. Segundo, at 6-0 the tallest Warrior who played, finished with a game-high 18 points despite sitting out the last 3:44 of the first half after picking up his third foul. Zoar Nedd finished with 15 points — 11 in the first quarter — and 10 boards, Ja’Shon Carter had 10 points and 10 rebounds, and Higa finished with 11 points for the Hurricanes, who shot 21-for-44 (47.7 percent) for the game while limiting the Warriors to 14-for-49 (28.6 percent). Kapolei coach Gary Ellison said he was relieved to leave Maui with a win. Warriors fans cheer during the first quarter. 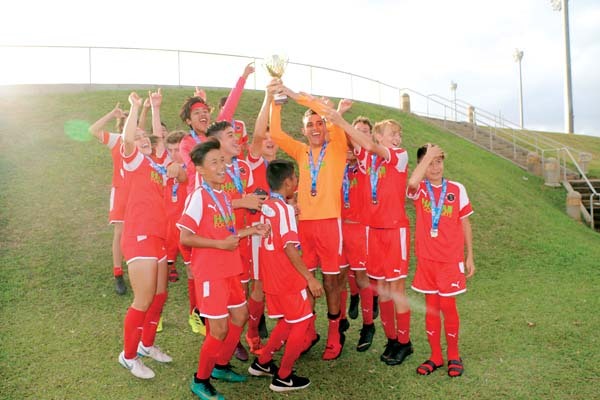 Isiah Higa 11, Jalen Miller 1, Zoar Nedd 15, Marquis Montgomery 6, Ja’Shon Carter 10, Kaimana Rodrigues 2, Hezekiah Del Prado 0, Kieran Queen-Booker 2, Nathaniel Whitehurst 0, Joshua Pices 0, Tumu Zamora-Fiaseu 0, Kevin Burkel 0, Kanoa Manalo 0, Julius Buelow 2. Kahai Bustillos 0, Kaimana Gerard 2, Kamalu Segundo 18, Austin Peters 10, Tiliti Adams 2, Blayde Demello 0, Beau Ramos 0, Henry Miguel 0, Ronson Iniba 0, Taj Falconer 0, Michael Kalalau 2, Iverson Dudoit 0, Colton Luke 0.